We decided that there is no point in doing any landscaping at the moment as the building work will likely damage anything we might accomplish. However, we have to do something! Tick season is about to begin and the yard is becoming a little dangerous to walk around in. The ground is not even, we have dug several holes, and we worry someone might hurt themselves in the long grass. A lawnmower isn’t an option either. The ground is full of rocks as well as being uneven and permanently wet from rain and dew. A brush cutter is the bigger version of an edge trimmer (aka weed eater). These are the ones that you will see municipal workers using on the sides of roads and highways, where a tractor cannot be used. The smaller edge trimmers are great for grass, but our yard is full of weeds, some of which have grown quite strong and tough over the last few months. This is the cutting blade for the brush cutter. Kevin and Louis were really excited when we were finally able to purchase a 68cc petrol brush cutter from Adendorff Tool & Machinery Mart. I must admit, I’m quite impressed with the beast too. It comes with both a blade and a wire cartridge. You can change the cutting mechanism depending on what you wish to cut. As our weeds have grown quite tough, we have been using the blade. Believe me, those plants stand no chance against the brush cutter. 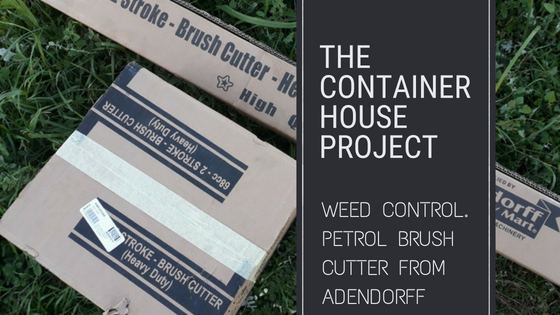 The brush cutter came with a set of accessories including the tools required for changing the blade/cartridge and adjusting the handles, safety glasses and gloves. The best bit? A handy zip pouch to keep all the bits and pieces in so that they do not get lost. Look at me being all farm-like! The brush cutter is easy to use. Kevin has noted that the strap and handle adjustment makes all the difference when using the machine. Before you use yours, make sure that it is adjusted correctly for you. It also has an excellent safety feature. The brush cutter has a pull start but the blade does not turn until you use the throttle. Therefore, you can power up the cutter and safely use the harness to hang the machine over your shoulder. From there you can use the throttle to engage the centrifugal (automatic) clutch, which will start the blade or cartridge spinning. This is also nice if you need to walk to a different area – the engine will idle and the blade won’t spin until you are ready to cut again. It didn’t take Kevin long at all to get the hang of using the machine. Kevin and Louis took turns cutting the grass, while Gwen and I took turns raking up the resultant salad. Adendorff Tool and Machinery Mart sell a variety of tools for all sorts of purposes, from engineering to household use. They have a huge range and their prices are reasonable. They have several branches located around South Africa. Their website is great! The entire catalogue is on the website, with up-to-date prices. If you are looking for something specific, you can have a look at all the options before visiting your closest branch. Adendorff have sponsored us the most amazing prize that we will be running as a giveaway in November 2018. If you haven’t yet signed up for our newsletter, now’s the time because you definitely don’t want to miss out on this opportunity! At least you can use your new toy! Yay…It is lovely to see how the vegetation is enjoying this rain. Everything is so green which is so much nicer than brown sand and dust! Yes, I’m going to be sad watching all the green whither and die over summer. And your farm-like pose is very convincing!